Do you speak in images? Enjoy taking photos to document your experiences or just to express what you notice in the world? Love to share them with others? Welcome to the weekly photo challenge! 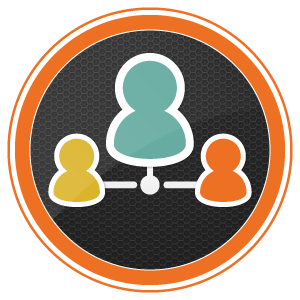 I post a new challenge each week…check in regularly and join the fun! Unofficially summer is over for me tomorrow…I head back to work to prepare for the new school year. I’m not dreading going back–I’m lucky, I love my work. But I do want to be reminded to continue to include play in my life, even when I am working. 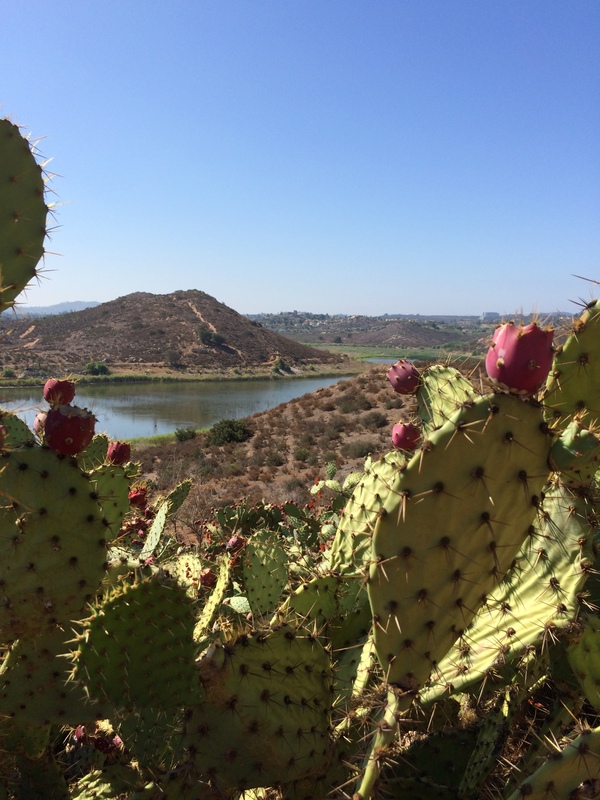 It’s also fun to play around with the framing of shots like this one using the prickly pear as a way to frame Lake Hodges in the background. There’s other kinds of framing that is fun to play around with too. 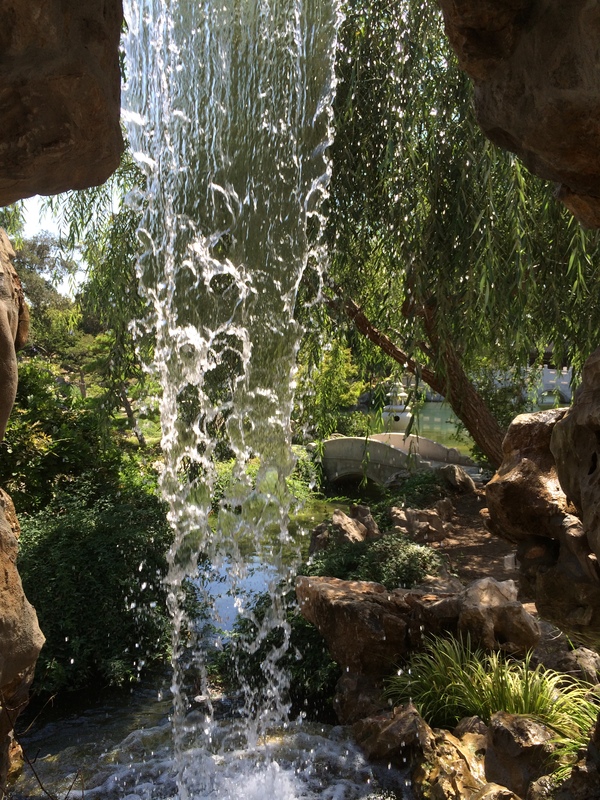 And sometimes it’s designers that create playful features like this one at the Huntington gardens where you can walk behind the waterfall…what a perfect opportunity to take a photo of the backside of water! 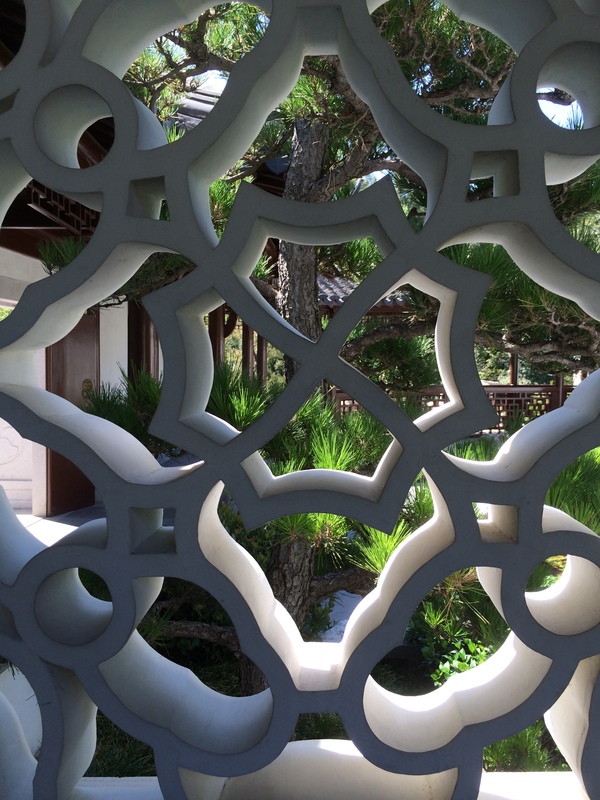 Other features like this decorative opening in a wall became a playful way of looking at the gardens beyond. And then there is play beyond the camera too. Visiting my son and daughter-in-law meant the opportunity to spend some time playing with their little dog Elli. 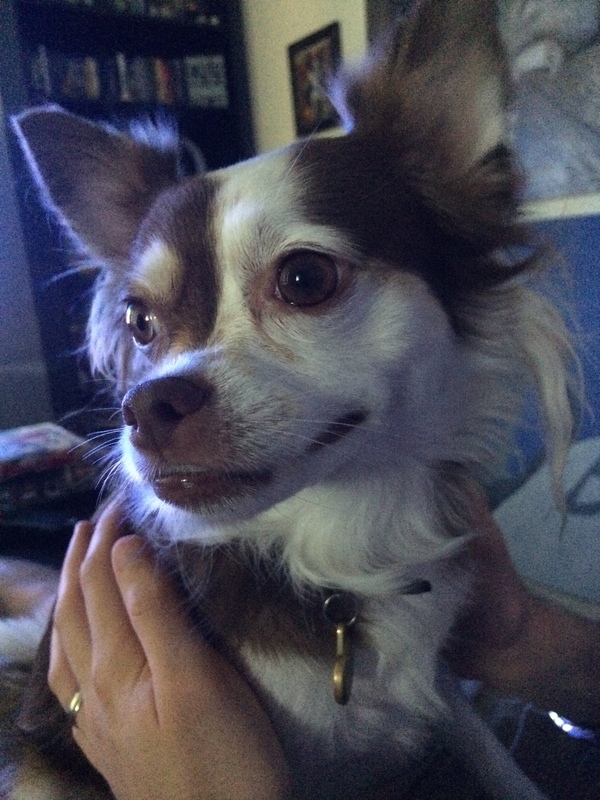 She’s a cute long-haired chihuahua and she loves to play! She likes to sneak some licks, bring her toys, race around the room… And of course, she is adorable! And sometimes I like to play with my little magnetic lenses. 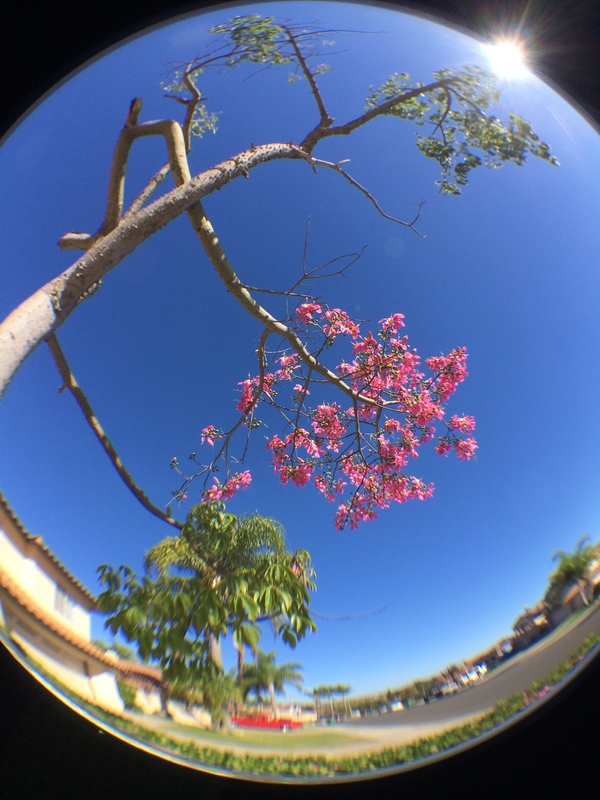 Today I had the fisheye lens out…one I don’t use too often. I wanted to capture the flowering of the tree in my driveway. Here’s the fisheye version. So this week’s challenge is to do some playing…with your photography or without photography…and then document it with a photo. I share my photography and writing on social media. You can find me on Instagram and Twitter using @kd0602. If you share your photos and writing on social media too, please let me know so I can follow and see what you are doing. 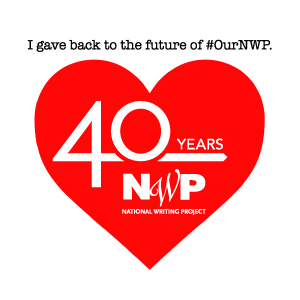 To help our Weekly Photo community find each other, use the hashtag #play for this week and include @nwpianthology in your post. Be sure to squeeze some play time into these last few weeks of summer! Can’t wait to see what you are playing around with! 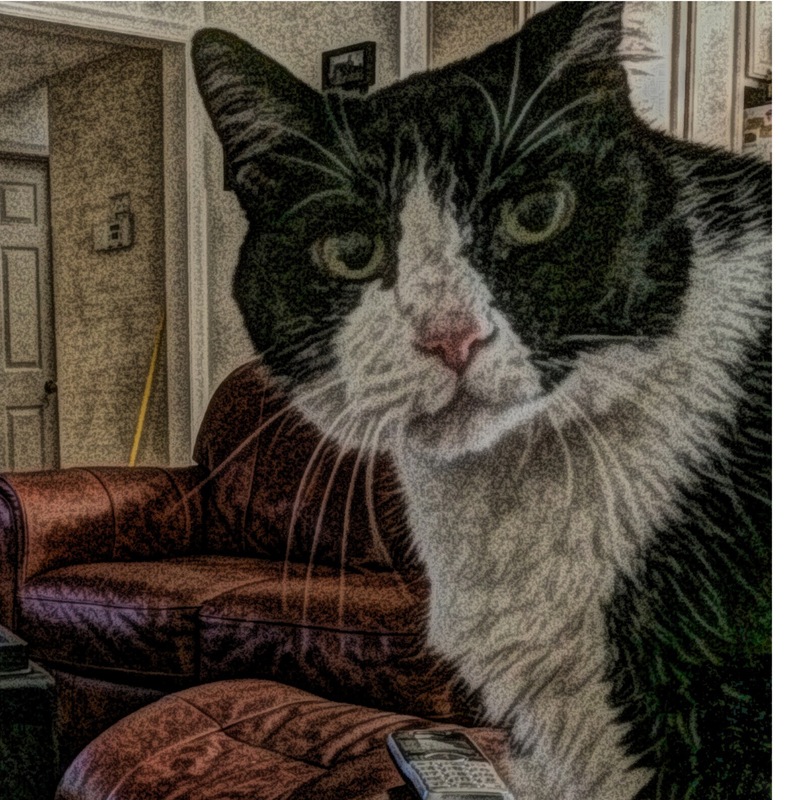 This entry was posted in clmooc, Weekly Photo Challenge and tagged iphoneography, photo essay, photography, play, writing on August 14, 2014 by kd0602. I’ve written frequently about the ways that photography helps me see what I would not ordinarily notice. Today’s post is about all those things that I notice when I am taking photos that I simply cannot capture or do justice to in a photo. A camera is a tool for learning how to see without a camera. And that has been true for me. Yesterday I was out taking photos with my youngest son. 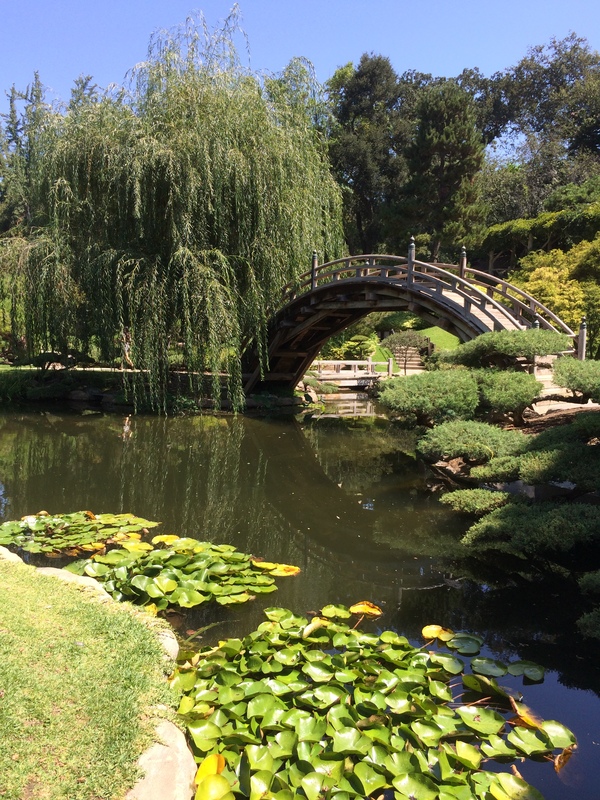 We explored the Huntington gardens and museums and old Pasadena…and I took some nice photos. But there were so many things I saw that I simply was unable to photograph. The Japanese gardens were extensive and gorgeous! The harshness of the midday sun was a challenge for photography. And while I love this shot of the bridge, I wasn’t able to do justice to the vibrance of the koi swimming below the bridge or capture the beautiful blossoms of the lily pads floating in the water. As we moved from the Japanese gardens to the Australian outback and into the desert, I was captivated by the hummingbirds. There were the usual Anna’s hummingbirds…the larger variety common to my area. But there were also these tiny hummingbirds, flitting and swooping from blossom to blossom…moving almost before you could see them, much less frame a photo. 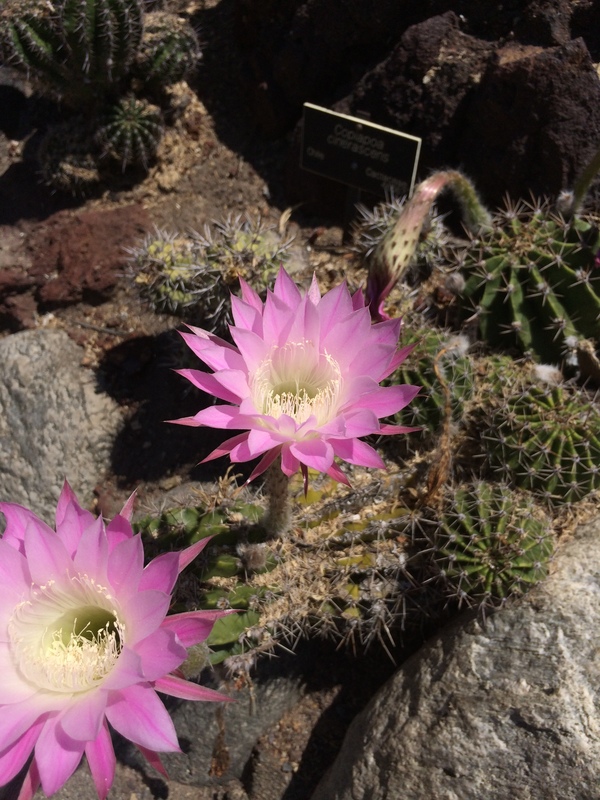 I did capture these beautiful cactus blossoms though. To cool off, we headed inside to the art gallery and the library. Even though this space feels unfamiliar, I am sure I visited this place as a teenager on a field trip. The only thing I can remember about the visit is seeing the paintings of Blue Boy and Pinkie. But walking into the gallery reminded me immediately of the Haunted Mansion at Disneyland! I found myself thinking about curation and exhibition as I walked through the library…noticing the stories told and the ways the displays invited visitors to experience historical events. 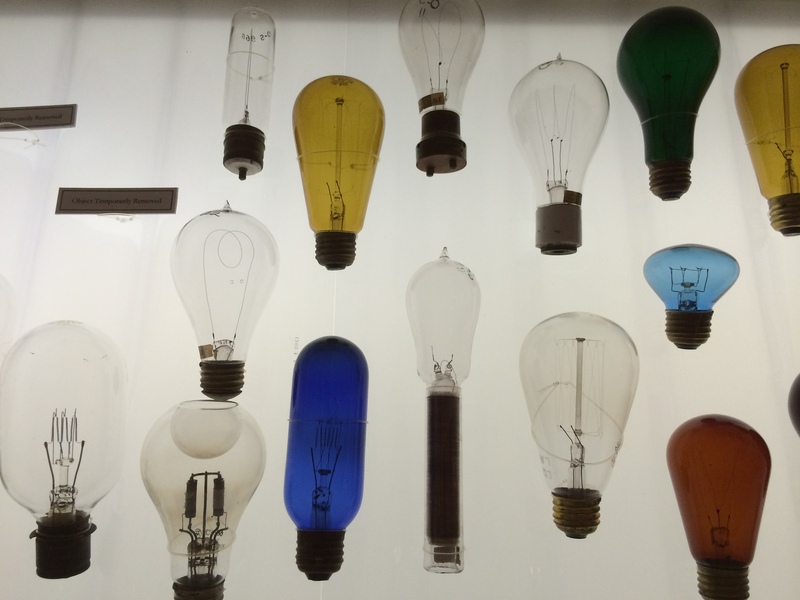 I also watched my son–as an adult–drawn to interactive displays, things that can be manipulated, looked though, turned, opened… I found myself drawn to this display of lightbulbs, showing how they have changed over time. And while this photo looks flat…like a poster, this is actually a display of the original lightbulbs. You can see the markers where someone has removed a couple of bulbs for study of some sort. I didn’t notice those until after I had taken the photo. I wonder what kind of study you do with old light bulbs. 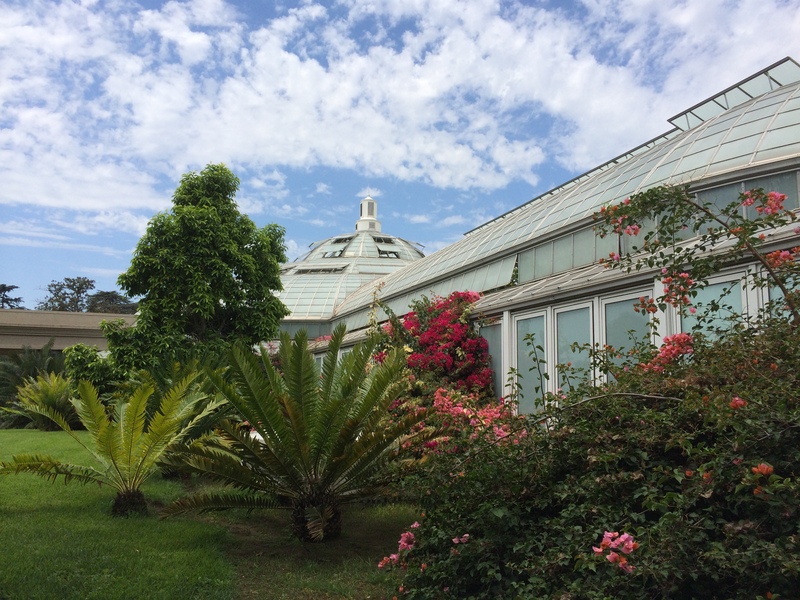 The conservatory is a big greenhouse filled with plants. And as we headed towards it, I was fascinated by the light blue and white of the building and light blue and white of the sky. And what I didn’t capture was the interesting ways that plants are adapted to their surroundings. The tiny fibers of the carnivorous plants, the special adaptations of seeds, and even the special slime of the slug we found slithering down the wall. 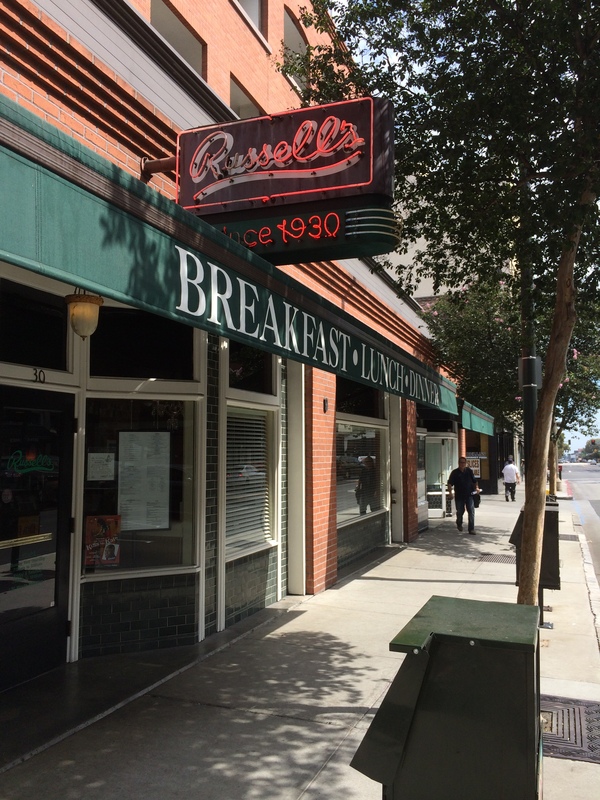 And what I didn’t capture was the stiff and proper waiter and the bright red interior…including the velvet curtain that separates the hallway where the bathrooms are located from the rest of the diner. 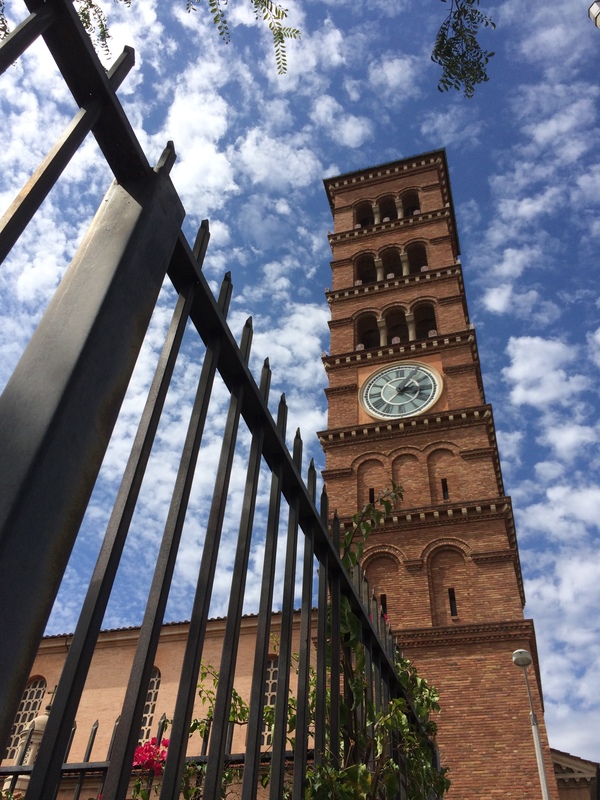 I noticed a clock tower as we drove to find parking. 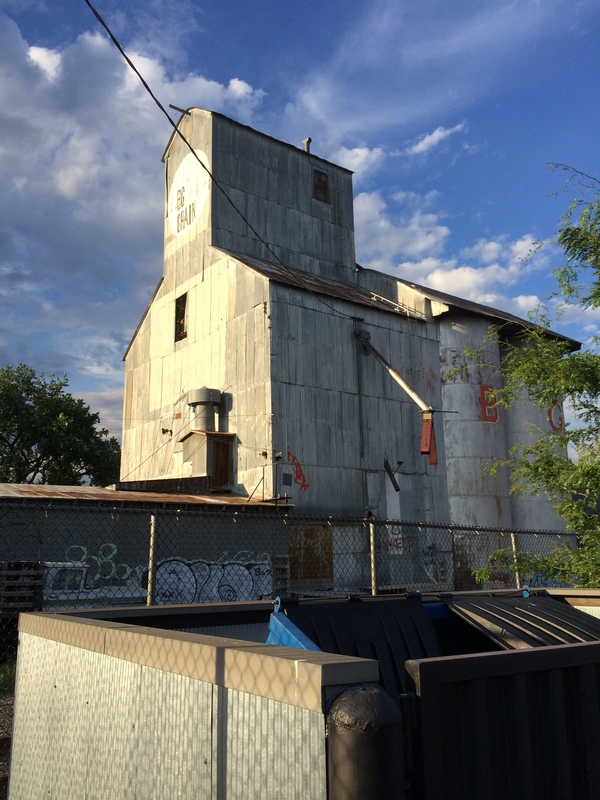 So once parked, we spent a bit of time exploring on foot…and found the tower. What isn’t captured is the way that downtown areas are an interesting intersection of poverty and affluence, those with no permanent place intermingling with those exploring that same place. 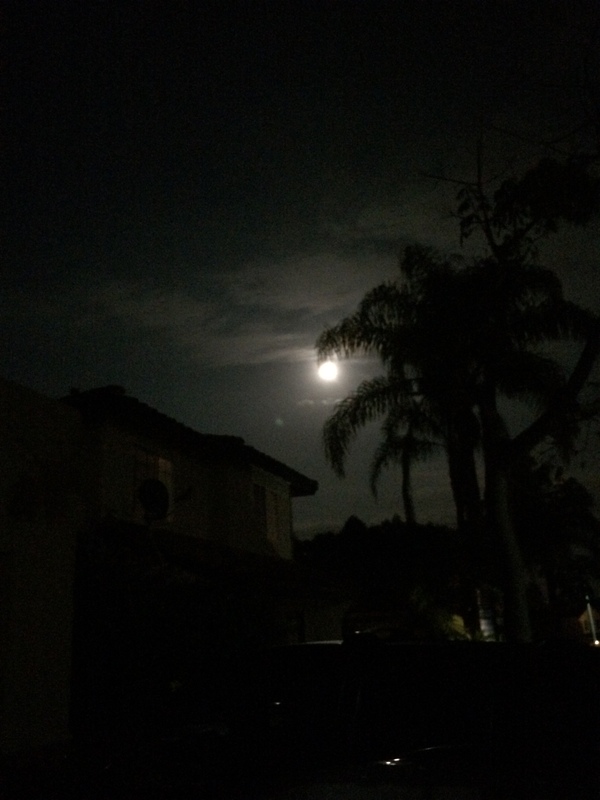 After dark, as I drove home, the large orangish harvest moon lit the way. As I drove I thought about the beauty of the moon…and how hard it is to capture it in a photograph (at least with my equipment). When I pulled into my driveway after a long and wonderful day, I did take out my phone a take a couple of shots anyway. And all day today I’ve been thinking about how much I see when I set out to take photos–more than I ever capture through my camera lens. For me, my camera has truly become a tool that helps me see far beyond the lens. I pay more attention to the world around me, even those things that I haven’t been able to capture in a photographic image. I’m still hoping to catch that insect in flight, the landing of a raindrop, the surprised expression of a loved one, light that caresses an image perfectly… But even more importantly, I am seeing those things even when I don’t get the photographic image…and that is priceless! 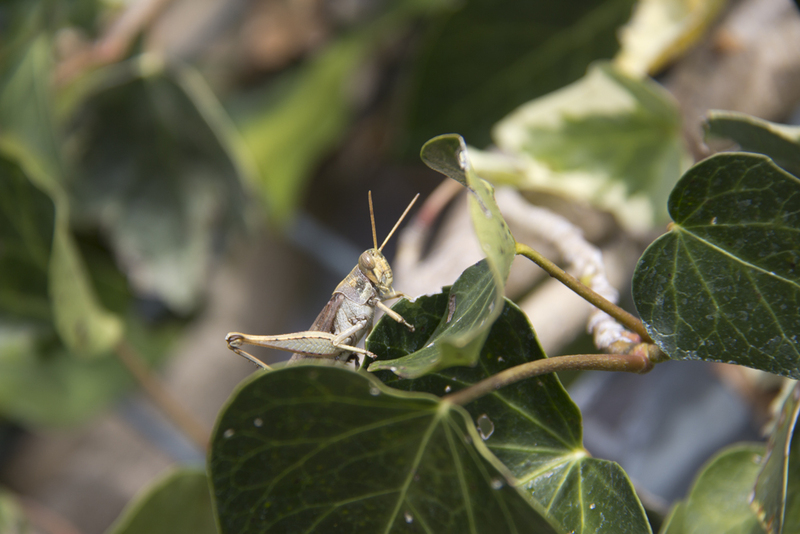 This entry was posted in photography, Slice of Life and tagged grasshopper, Huntington library, iphoneography, Japanese gardens, noticing, Pasadena, photo essay on August 12, 2014 by kd0602. I love using the macro lens. 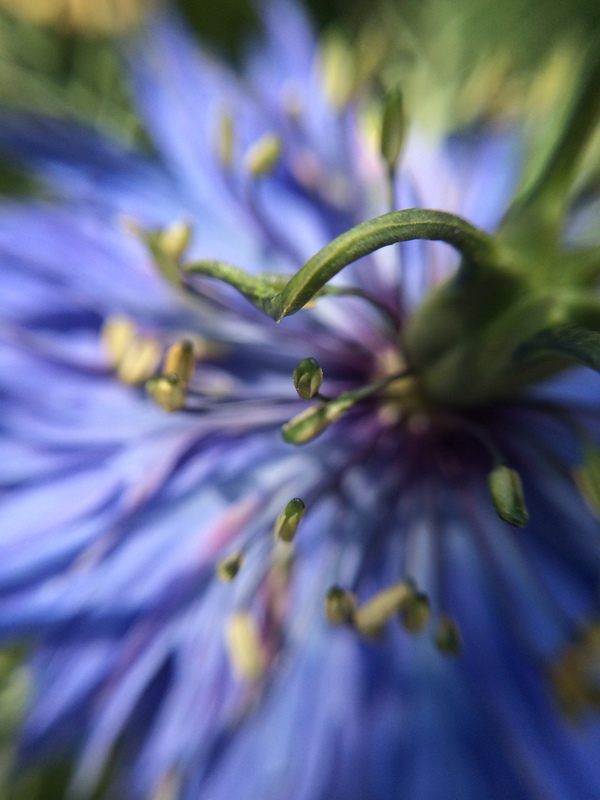 It magnifies subjects so that what is ordinarily unnoticed suddenly takes shape and comes to the forefront. So when I saw the Daily Post weekly photo challenge topic of texture…I knew exactly what I wanted to post. The macro lens on my iPhone is not particularly convenient, I have to take the cover off my phone and then attach the magnetic lens, so I don’t use it as frequently as I would like. 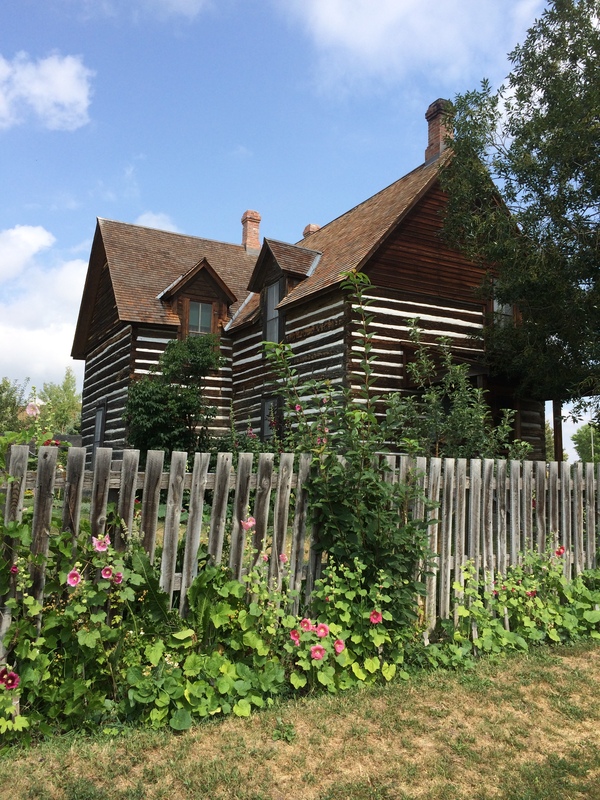 Earlier this week I was in a beautiful garden…meant to be a replica of a homestead garden…in Bozeman, MT at the Museum of the Rockies. A bounty of flowers and vegetables flourished…calling my attention. There were poppies, sunflowers, and myriad flowers whose names I don’t know. And the onions were magnificent! And while we needed to head out to the airport for our flight home, I just had to steal away a few minutes for some macro shots. Here is one of the onion above. 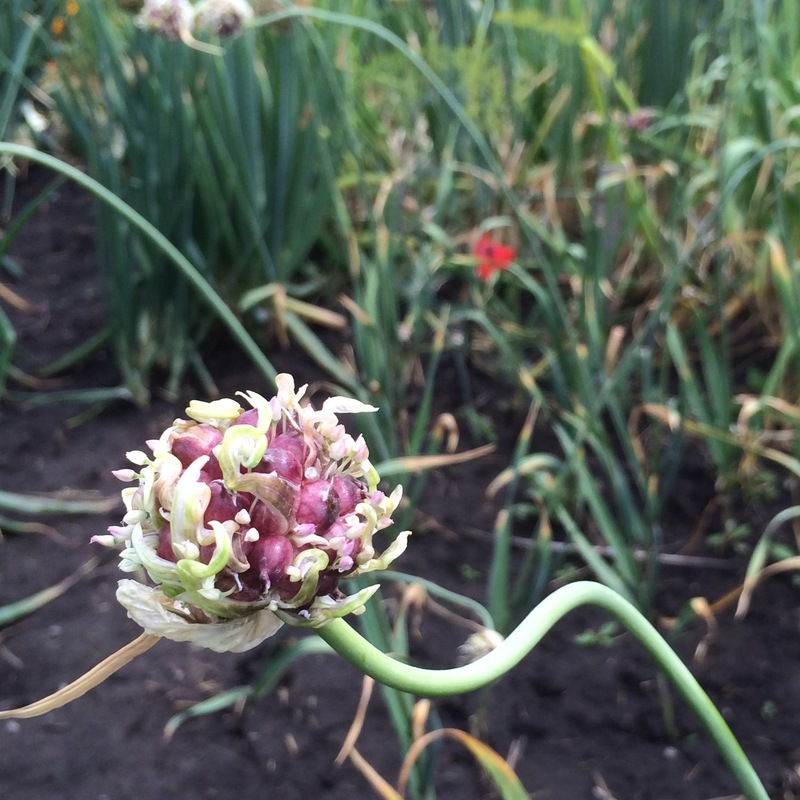 And here is one of the blossoms of a different variety of onion. The brilliant red poppies also caught my eye. 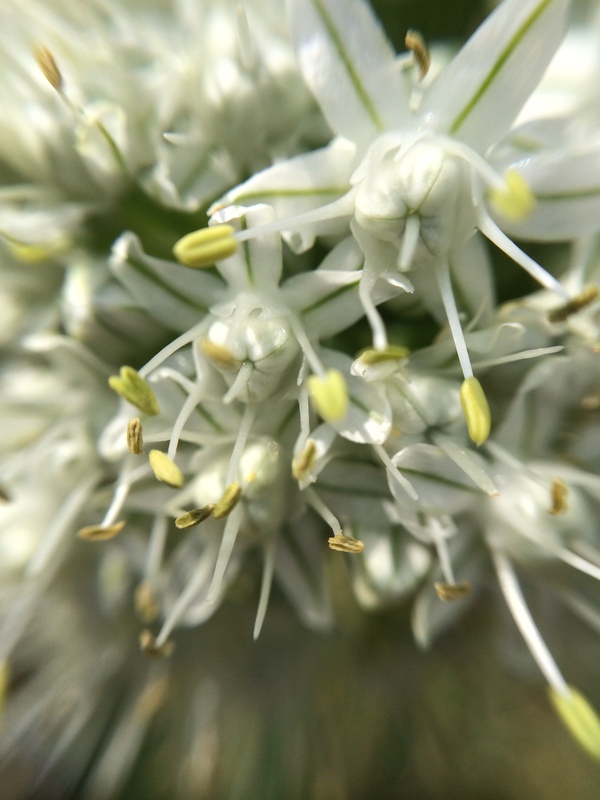 They are gorgeous without looking closely, but magnification brings out the delicate tendrils and the distinctive centers. And I also saw these same centers standing alone without the crimson petals. This fluffy tan ball revealed small individual flowers through my macro lens. 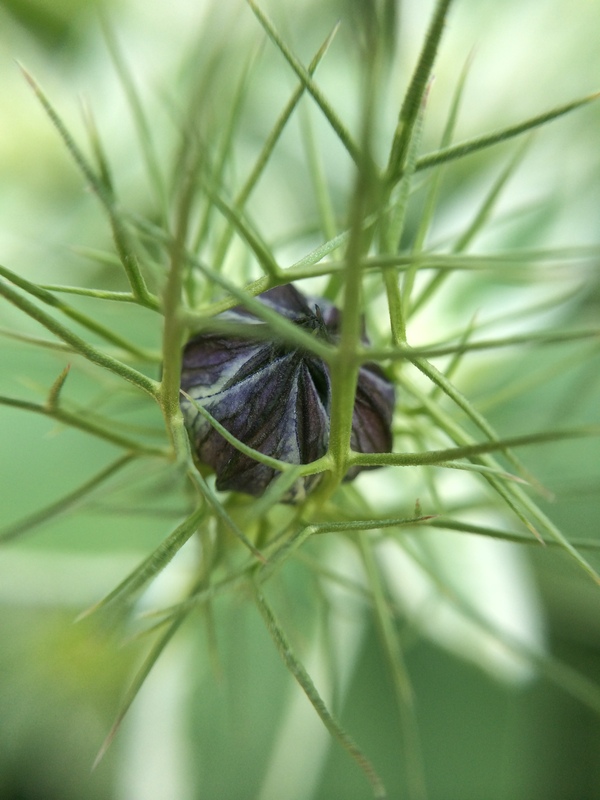 I’m not sure what this tiny purple ball wrapped in green spines will look like when the bloom opens. 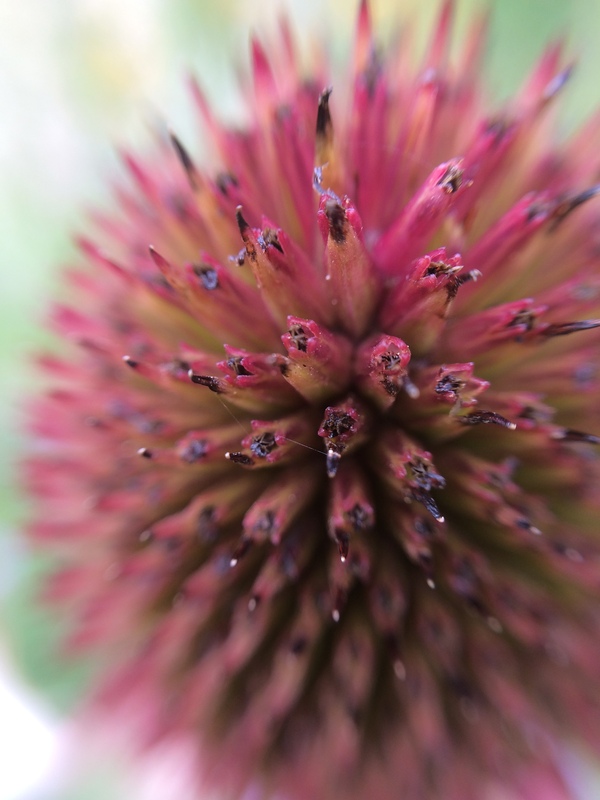 When looking closely through the macro lens, centers pop, revealing intricacies of design. Looking closely creates opportunities to pay attention. Seeing the contrast between hard and soft edges and elaborate design with repeated patterns also seems to draw attention to the vibrance of color…like in this purple blossom. 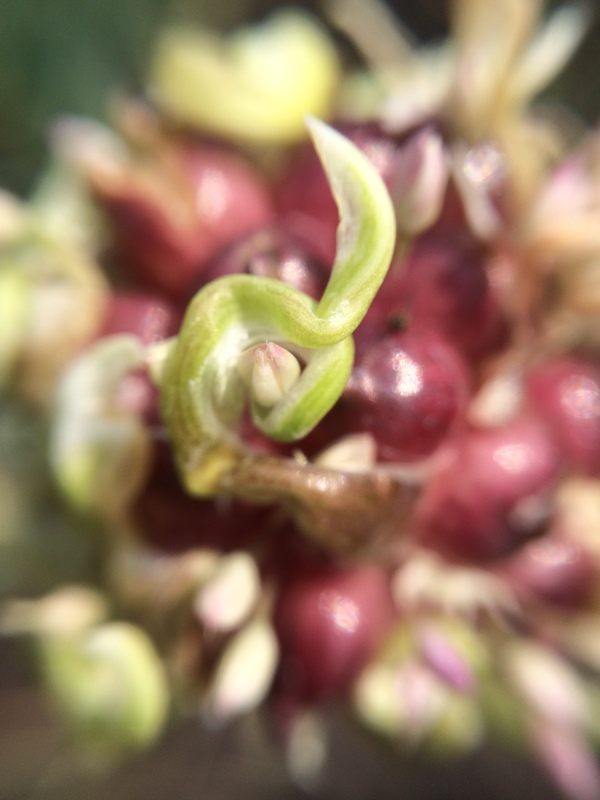 Textures often go unnoticed when we look at flowers and vegetables. Instead we tend to notice the overall shape and general color, and sometimes the fragrance as well. 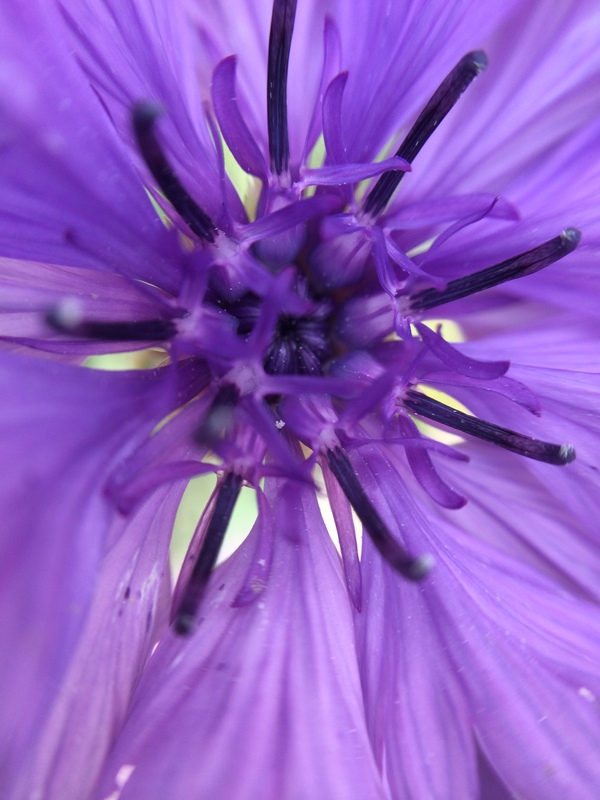 I love the ways the centers of flowers uncover distinctive details about how the flower reproduces and unfolds. What originally appears smooth and soft is more complex and nuanced with a closer look. And that is true of life too. 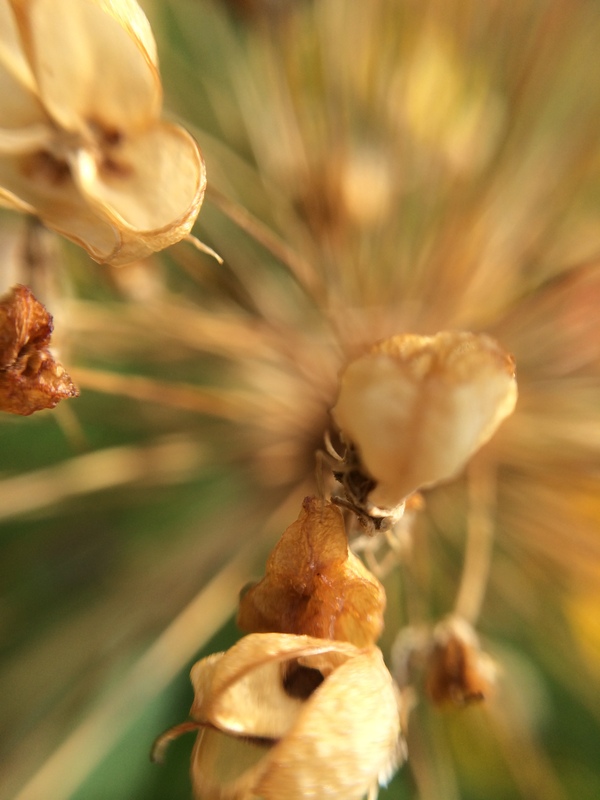 Looking closely and paying attention can change our observations and our perspective. 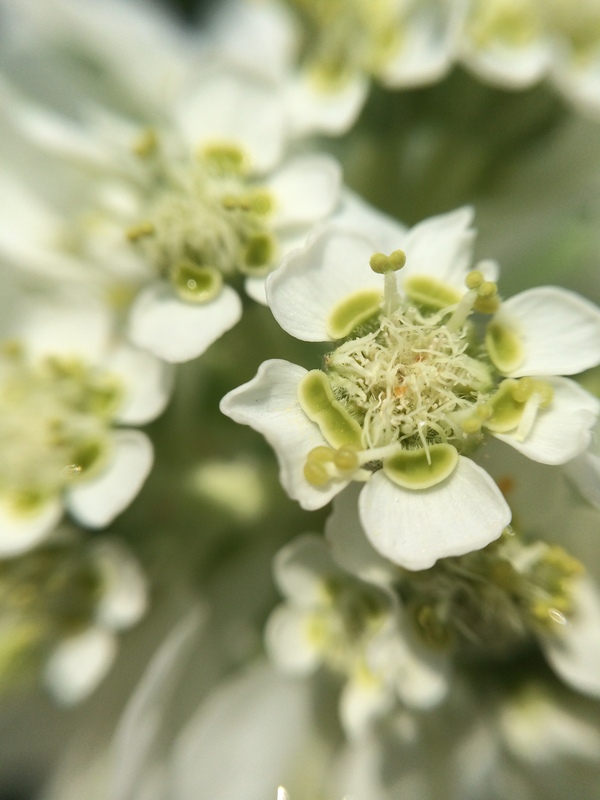 Sometimes you just have to lean in and take the time to smell…and photograph the flowers! 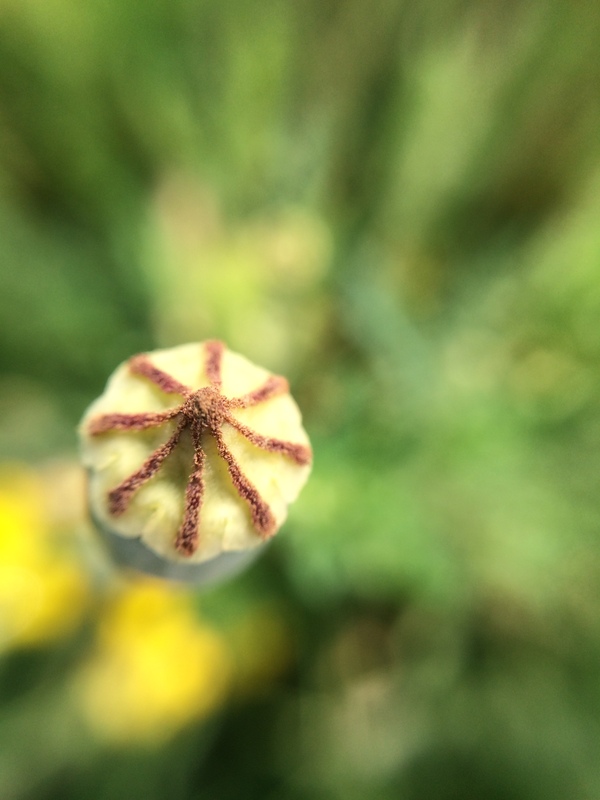 This entry was posted in photography and tagged detail, flowers, Garden, iphoneography, macro, observation, photo essay, texture on August 9, 2014 by kd0602. As summer winds down and the new school year looms and beckons, this is a perfect time for some exploration. Exploration can happen anywhere and anytime…you just have to take the time to pay attention to your environment. 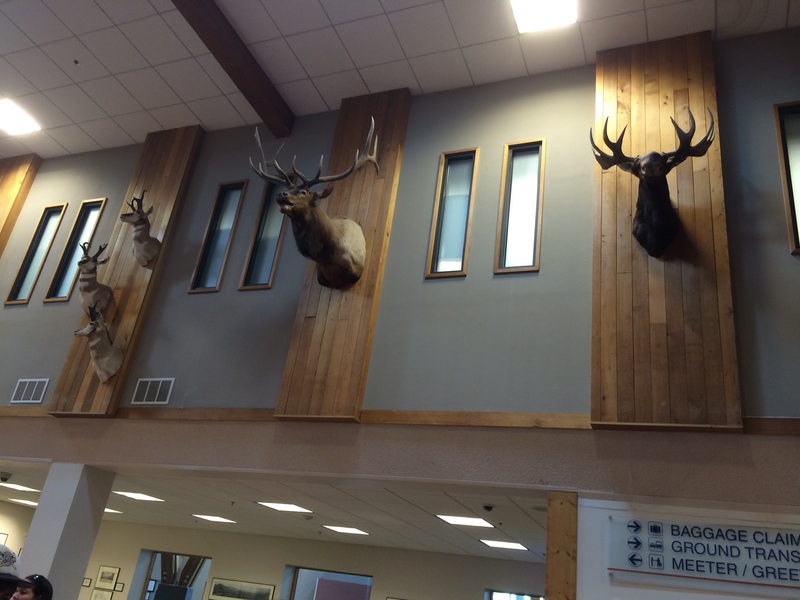 Last week when I flew into the Missoula International Airport I immediately noticed the taximdermy heads of animals decorating the walls of the airport. 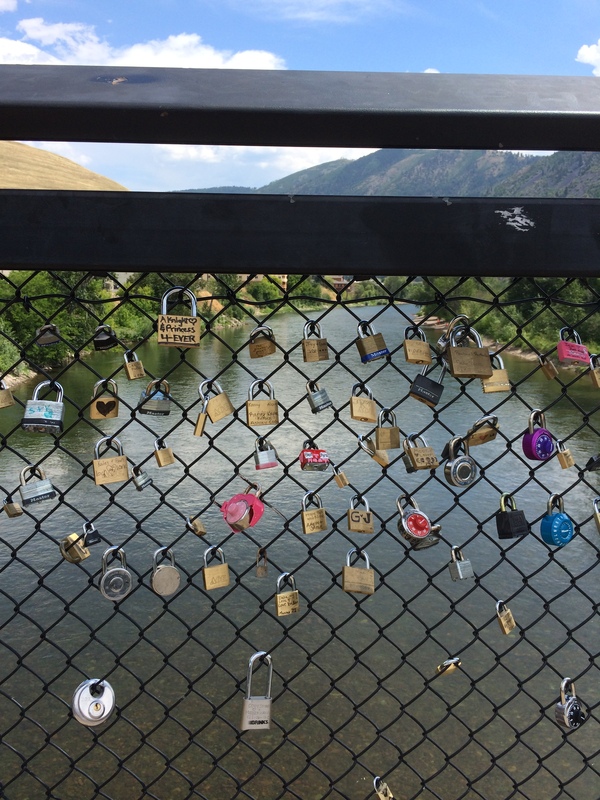 Crossing the Clark Fork River, I stopped to explore these locks connected to the bridge. I’d heard about locks like these on bridges in Europe, but this was my first encounter with locks carved with initials and names locked to a bridge here in the US. 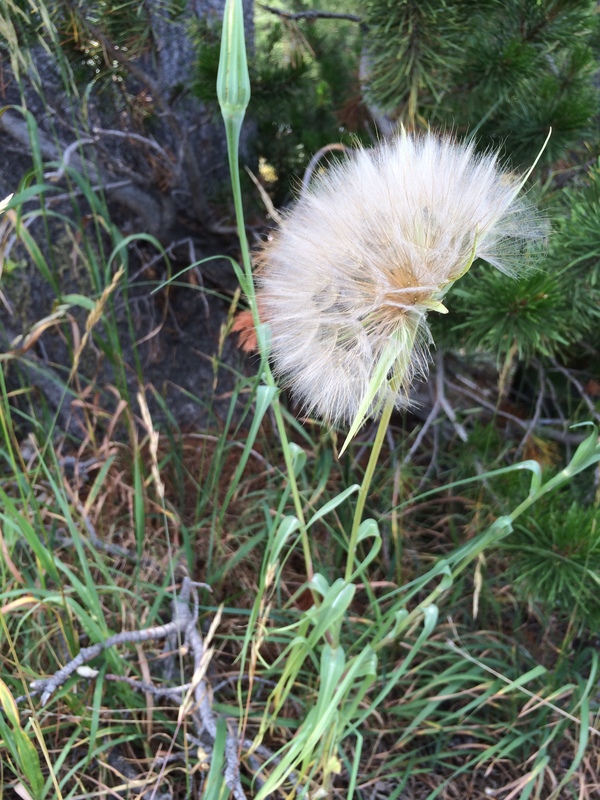 Also, in my Montana and Wyoming explorations I was amazed at the giant dandelions. The fluff balls were easily as large as my fist! I’ve also been interested in buildings. In Bozeman when we stopped for dinner, I was immediately taken by this old building and couldn’t wait to capture it in a photograph. I also got to explore the history of homesteading through the Tinsley House, a living history exhibit at the Museum of the Rockies in Bozeman. They had spectacular gardens, a working blacksmith shop…aiming for authenticity from the 1890’s. And of course, exploring Yellowstone was an amazing experience. I have posted extensively about my experience in the park…and there is more. 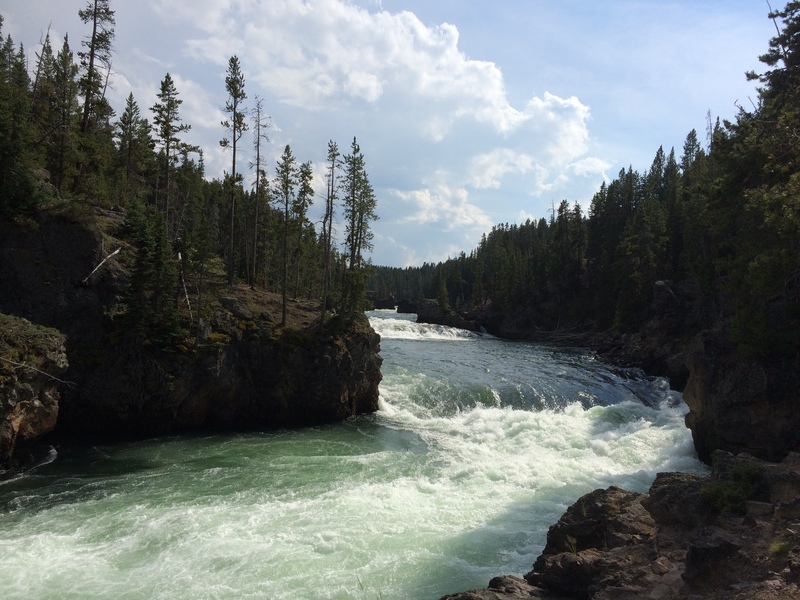 Living in San Diego, I seldom have the opportunity to explore the majesty of rivers–but Yellowstone was filled with them. Here’s one example. Even the construction in the park caught my eye. 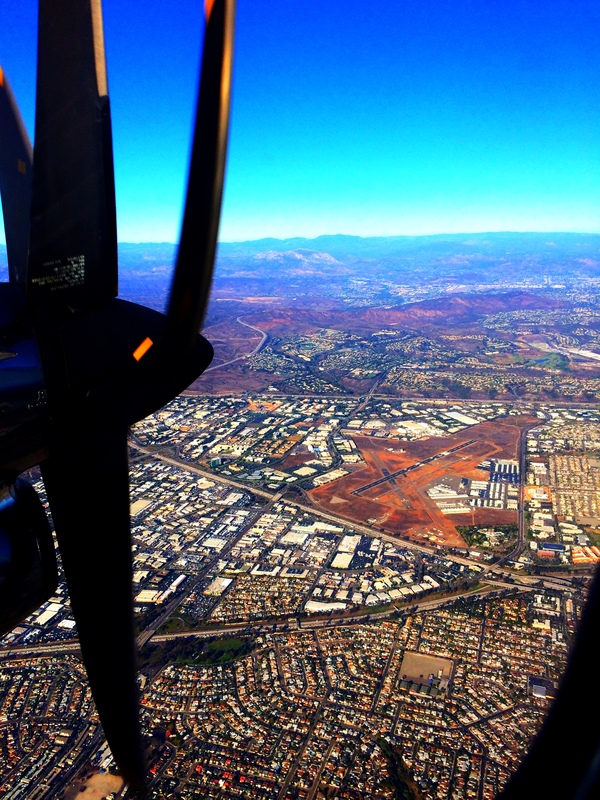 On the last leg of my trip home I had the opportunity to fly on a small propeller plane…and to have a window and an aisle seat all rolled into one. At a relatively low altitude of 9000 ft, I had a wonderful view to explore the southern California coastline from the air. But there is lots to explore even at home. 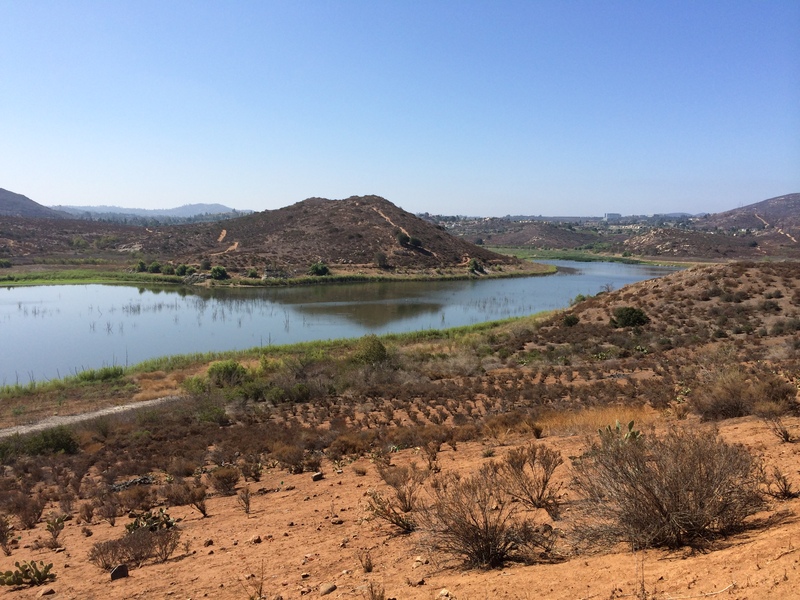 Today I took a four mile walk near my house to a bridge near a golf course where I took a shot of the surrounding area from the top looking out. 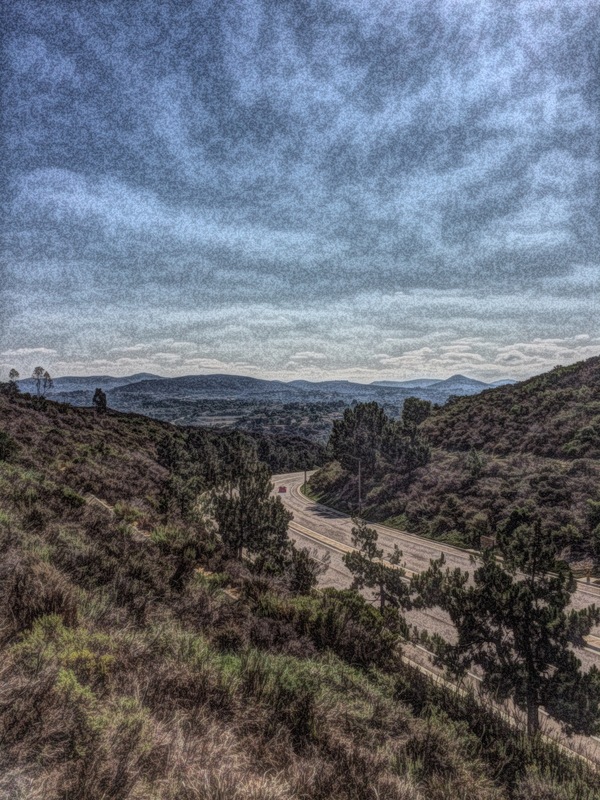 With a little help of the application Painteresque, what some might see as ordinary becomes extraordinary. So this week’s challenge is to explore, and then to capture some aspect of that exploration in a photograph. It can be from your travels, your work, or even the ordinariness of your everyday life. Let your photographic eye explore the world around you…wherever you are! I share my photography and writing on social media. You can find me on Instagram and Twitter using @kd0602. If you share your photos and writing on social media too, please let me know so I can follow and see what you are doing. To help our Weekly Photo community find each other, use the hashtag #explore for this week and include @nwpianthology in your post. Have some fun exploring as summer begins to wind down. I can’t wait to see the photographs your exploring leads you to! This entry was posted in Weekly Photo Challenge and tagged explore, iphoneography, nwp ianthology, photo essay, writing on August 7, 2014 by kd0602. This morning someone shared an article about kids as citizen scientist researchers–observing and documenting ladybugs in their place, and learning about research and data in the process. I love engaging students in real work as part of the learning process…and teaching them that all of us, as part of our daily lives, can and should continue to learn every day. 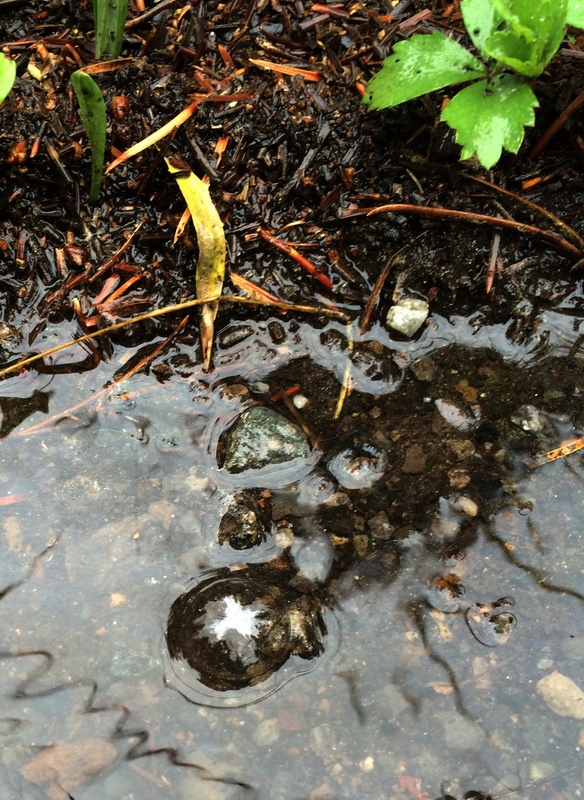 On our rain hike in Yellowstone the other day I got to look closely at the environment around me, noticing details and appreciating the beauty. 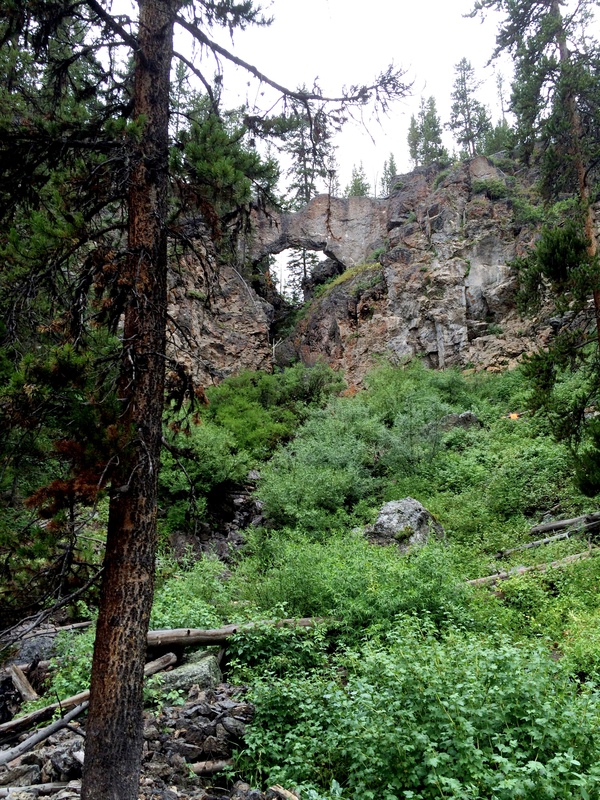 Our destination was this natural bridge, a work of nature that I’m sure informed the first people who saw it. 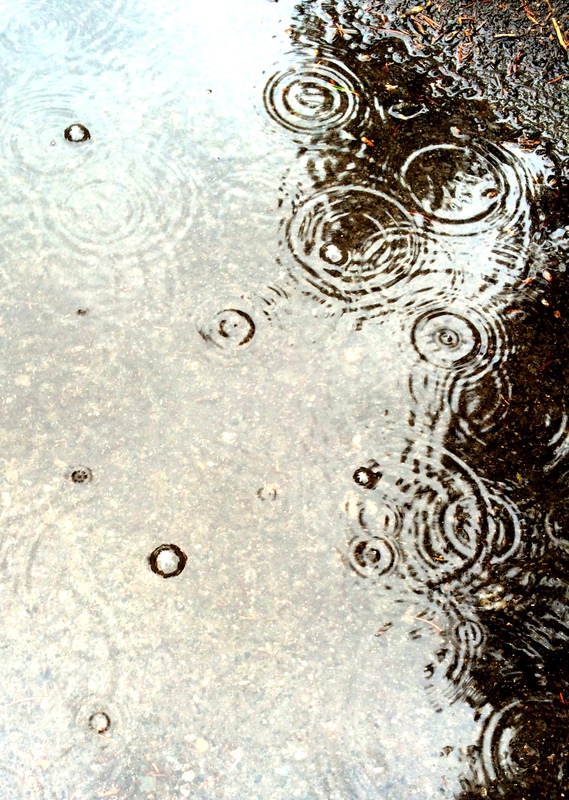 And as we walked away from the bridge back toward the car, I noticed bubbles in the puddles as we passed. I was sure I was noticing something in the bubbles…and stopped to watch. 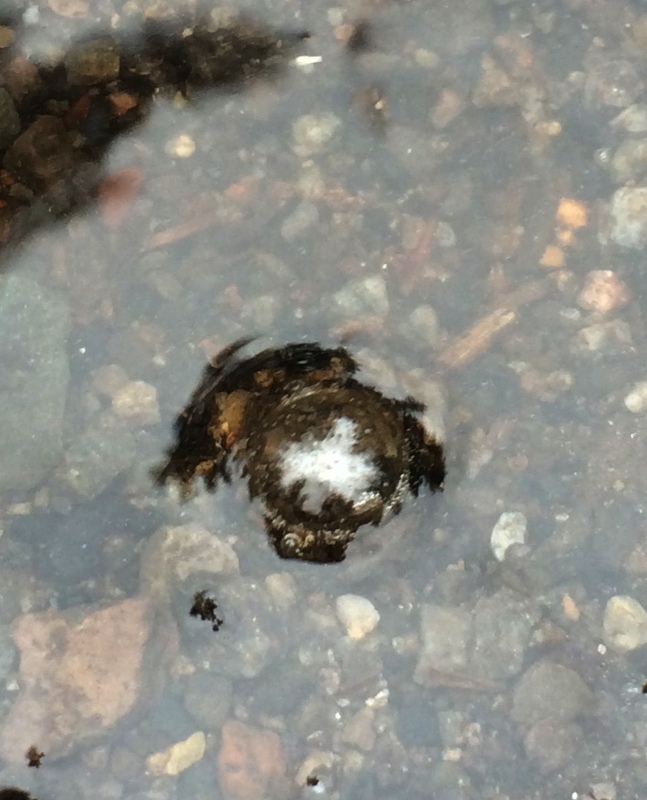 It seemed that with the rain drops, a bubble would form with a white insect in it–magnifying the image of the bug–and then pop after it floated a ways. I had to look closer…what were these creatures? And why do they form these bubbles? Do they only come out in the rain? Are they native to this forested area in Yellowstone? There are so many interesting things to learn about when you take the time to notice. As I start to prepare for the beginning of school, I’m thinking about ways to support and encourage my students to pay attention the world around them and then to document and further research the questions that interest them. I’ll also be on the lookout for citizen scientist projects in my area (and would love any information you might have)…what a great way to engage students as researchers! And if you happen to know anything about these bugs in the bubbles…I’d love some leads! 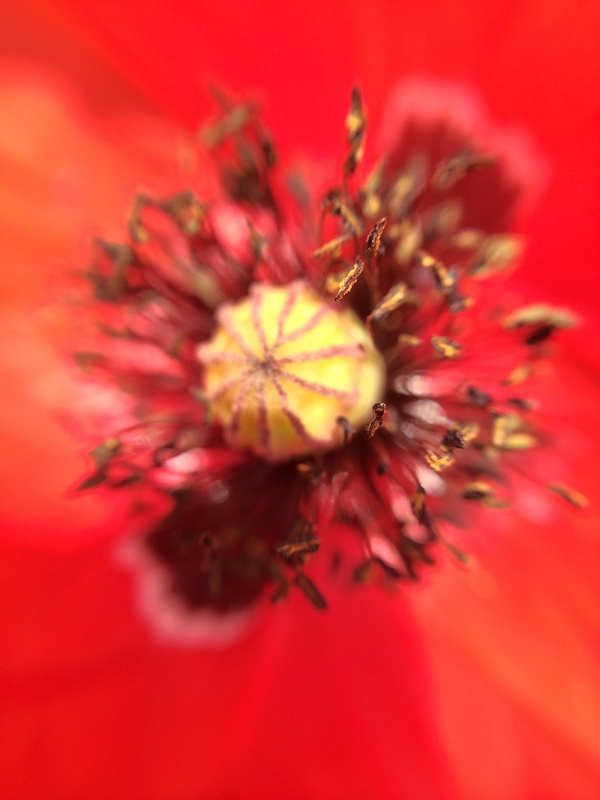 This entry was posted in clmooc, Connected Learning and tagged insects, iphoneography, natural bridge, photography, science, science questions, Yellowstone on August 6, 2014 by kd0602. This really is a month for the unexpected! 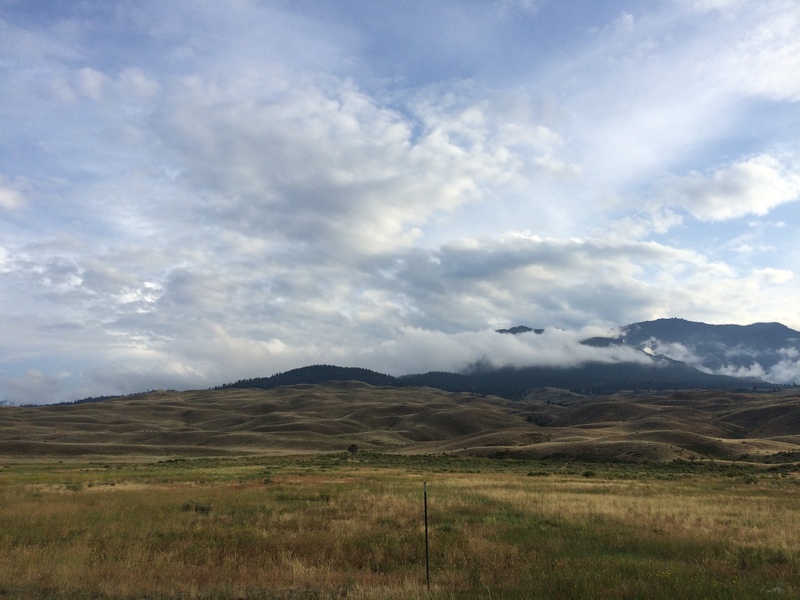 On our last day at Yellowstone, we set off early knowing we were heading toward the other side of the park and hoping that an early start would bring more opportunities to see wildlife. As we sipped our coffee and drove down the road, we suddenly saw a bear ambling across the road. 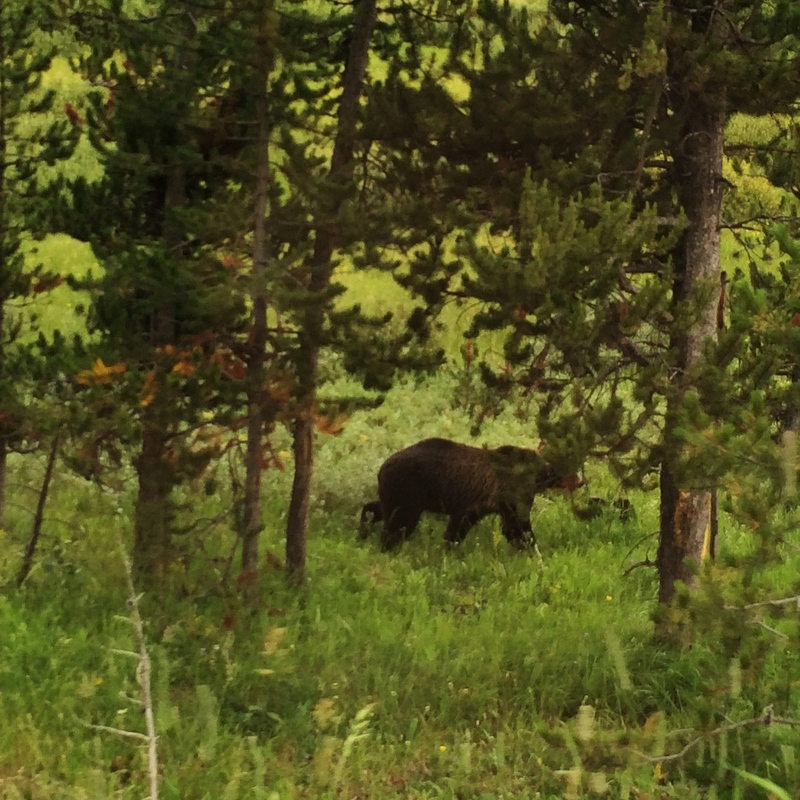 You might remember from yesterday’s post that Geoff had his heart set on seeing a bear during our visit…so imagine our excitement and the jolt of adrenaline when we spied the bear ahead of us on the road! 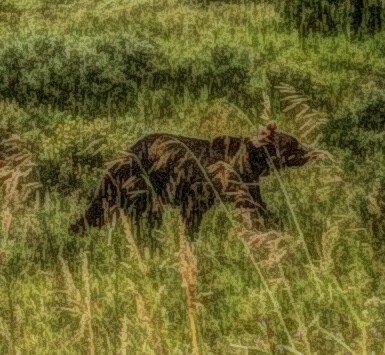 I grabbed my phone as the bear looked up and headed off to the side of the road. I started taking pictures as it headed off, stopping and looking back at us then continuing into the trees. 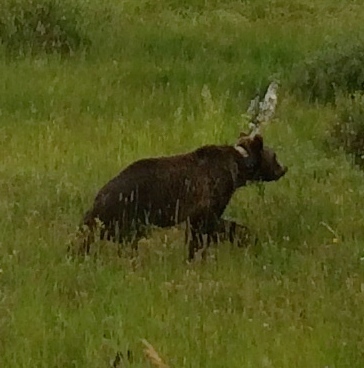 This bear sighting was truly the cherry on the top of this trip to Yellowstone! Even the rainy day couldn’t dampen our spirits or spoil our adventures. As a lark, later in the day we decided to take what we thought was a quarter mile hike to a natural bridge in the rain. Donning our rain jackets with hoods on, we headed down the path through the woods. That quarter mile turned out to be at least a three-mile round trip in a steady downpour…and totally worth it! The natural bridge was spectacular! We ended our day with dinner at the Mammoth Hot Springs Hotel, a delicious and relaxing ending to three days in the park. The rain stopped and the sky brightened. As we drove out of the park towards our hotel, the sun and clouds gathered to create a gorgeous skyscape. We stopped not far from the arch to take this final photo at Yellowstone. Our time in Yellowstone has been amazing, filled with the unexpected. We’ve enjoyed exploring the natural beauty, spending lots of time outdoors, and piquing our interests to learn more about the natural world. There is so much more to say…and so many more photos I’ve taken on this trip. 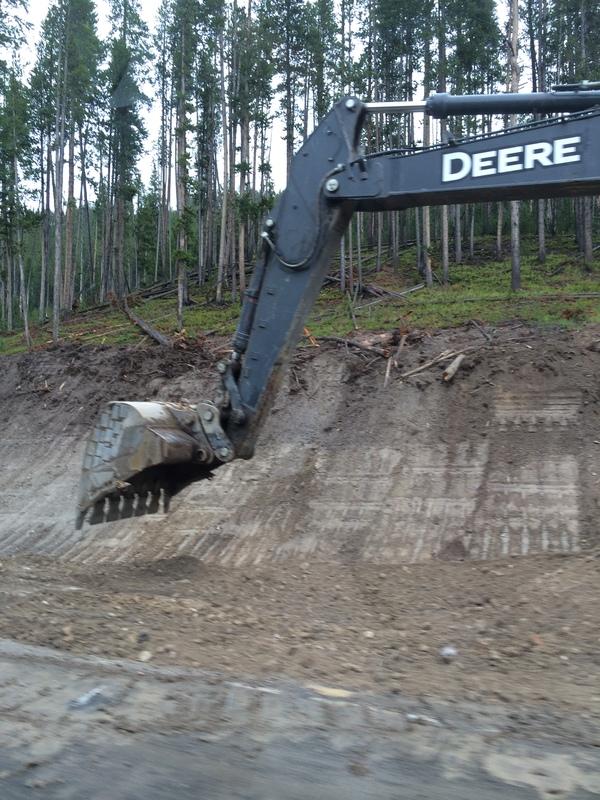 I’m sure you will be hearing more about my adventures in Montana and Wyoming! 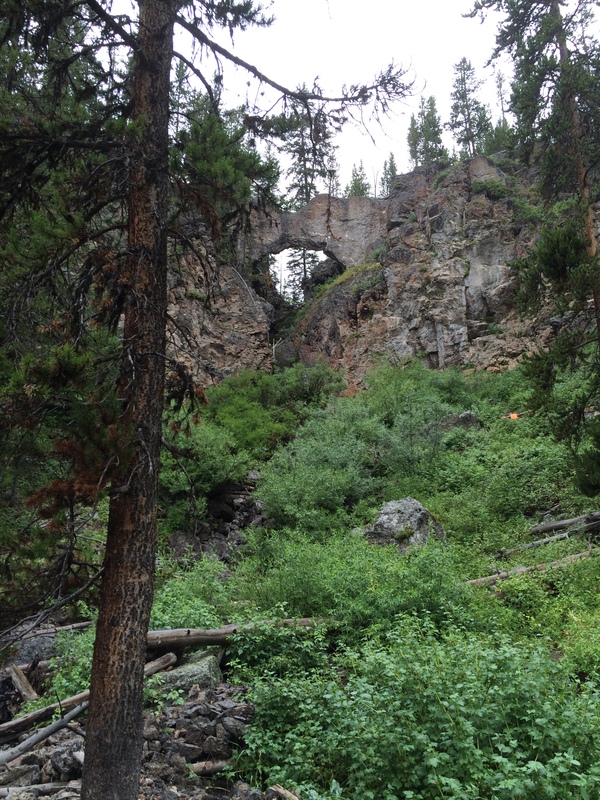 This entry was posted in nature, photography, Slice of Life, Uncategorized and tagged bear, grizzly, iphoneography, natural bridge, photo essay, sdawpphotovoices, unexpected, Yellowstone on August 4, 2014 by kd0602.